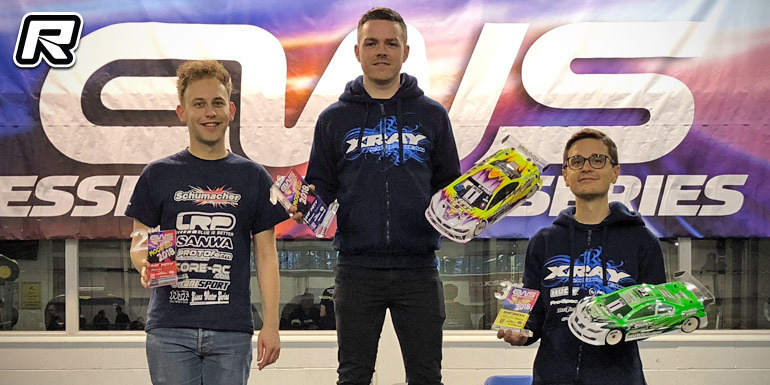 The final round of the 2017/18 Essex Winter Series took place this weekend. As the UK was affected by another freezing and snow-filled weekend, it was great to see another almost capacity entry to round out a busy year, which was also bolstered by a “guest heat” of the popular Tamiya Trucks. 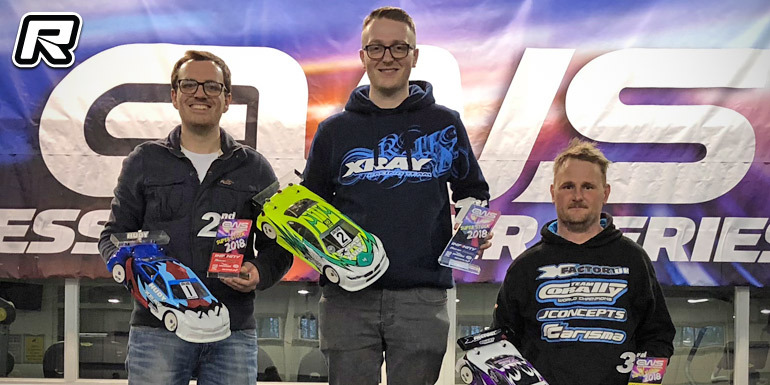 With the Modified title already decided, Olly Jefferies decided to sit out this round, but still was trackside to cheer on his team and help them out for the finals. It was therefore Elliott Harper, who already had one hand firmly on the championship runner-up trophy, who got proceedings underway by topping the first two rounds of qualifying for Schumacher. Alexander Hagberg, who took his first ever EWS win at the previous event, was close to Elliott but had to settle for 2nd each time. 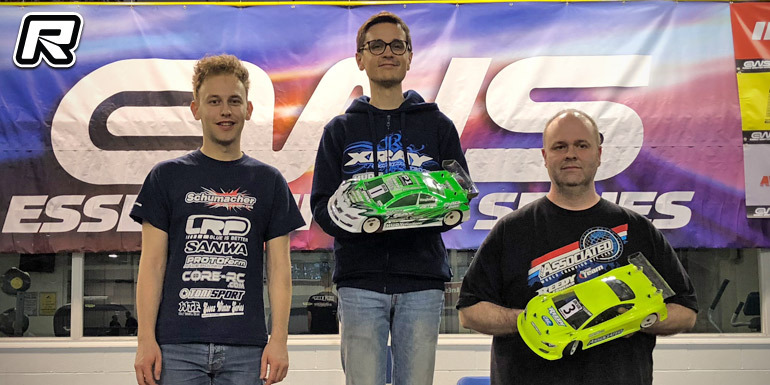 The fight for third was much closer, however, with the top five in Q1 being filled out by the Yokomo of new Maclan signing Harley Eldridge, Team Associated’s Chris Grainger, and the Schumacher of former series champion Stefan Chodzynski. The second qualifier saw Matt White take 3rd for Associated, in front of Harley and Stefan. The third round had Alexander taking the fastest time by just three-hundredths of a second over Elliott, with Matt again 3rd, Stefan 4th and Harley 5th. Alexander secured the pole position by then taking the final round, this time with the much bigger margin of a mere two-tenths of a second over Elliott. Matt was clearly into his stride and again took 3rd, with Harley in 4th and her dad Brian Eldridge (Yokomo) 5th in the round. This meant Matt would line up 3rd on the grid ahead of Harley, Stefan and Chris, with Brian in 7th, and first-time EWS A-finalists Jon Seals (8th) and Steve Davis (10th) sandwiching Schumacher designer Aaron Rose, who lined up ninth. The A-final saw Elliott put some initial pressure on Alexander for the opening couple of laps, with Matt also sticking with them as the race got underway. However, Alexander slowly opened up a lead of around 1.5 seconds as Matt fell back and had to be aware of the presence of Harley behind. Elliott and Alexander trading lap times, but ultimately Elliott wasn’t able to close the gap down and so Alexander ran out the clock to take his second consecutive win at EWS, with Elliott taking second and Matt completing the season with third. When the points were added up, it confirmed Elliott in 2nd place overall, with Alexander’s result elevating him to 3rd in the series standings. In the Super Stock Class, Zak Finlay was looking to make it a clean sweep of TQ and wins and become the first driver in EWS history to do so. But it was Tony Broad, consistently the “best of the rest” this year behind Zak who set the best time in the opening qualifier with his privateer Xray, with Zak in 2nd, two seconds back and Chris Ashton, Colin Jackson and EWS returnee Billy Fletcher making up the top five. Q2 again saw Tony set the pace, but with the gap now just one-and-a-quarter seconds over Zak’s Xray. Billy took his Destiny to 3rd in front of Chris (Schumacher) and Ashley Wiffen (Awesomatix). The third round had Zak now on top of the leader board, with the best time so far, Tony in 2nd ahead of Billy, Chris and Ashley again. The final round saw a showdown for pole position, which eventually went to Tony by just one-and-a-half tenths of a second. Billy was again 3rd, with Ashely and Chris again making up the top five. This meant that Billy would line up 3rd on the grid in front of Chris and Ashley, with championship podium contenders Colin Jackson and Richard King would have work to do from 6th and 8th respectively, as Tom Green made his first EWS A-final in 7th, and the grid was rounded out by Mark Buonaiuto (9th) and Jack Ioannou (10th). The A-final saw Tony and Zak break away from the field very quickly, as the fight behind would decide the final step on the overall series podium. Zak remained close to Tony, keeping the pressure on, but Tony was having none of it and kept his car in front of the Champion-elect to take his first EWS win since the end of 2016. Behind, Billy hung onto third as Chris and Ashley duked it out, with Ashley not quite able to pass Chris and having to wait to see if his earlier championship scores would be enough. 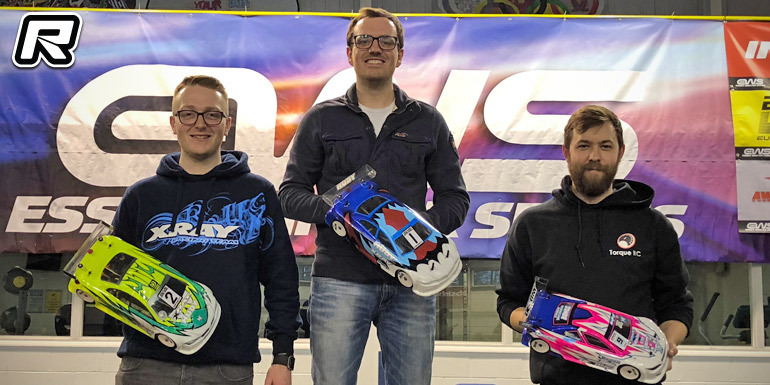 The championship points were added up, and despite Chris Ashton’s great end to the series, Ashely hung onto third overall and the final place on the podium. Within the Super Stock series, EWS implemented a Sportsman championship for the first time this year. 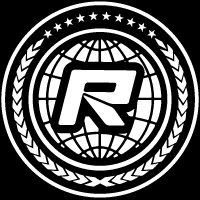 Any driver who did not make the A, B or C-final this season or last was automatically entered, and gave those throughout the field something to race for. It was a close fought battle all season, with it coming down to the D-final race of the final round of the series. 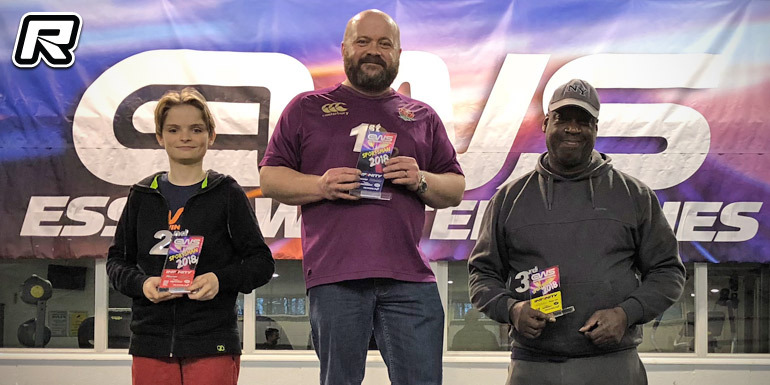 It was EWS resident DJ Mark “Dougal” Caton who took the overall win, just a single point ahead of up-and-coming youngster Oscar King, and long-time EWS supporter Paul Issacs clinching the 3rd place trophy. Finally, the guest heat of Tamiya Trucks saw some exciting racing throughout the day, with the truck drivers displaying some great sportsmanship and demonstrating the fun element of the class. Alan Chipolina would line up on pole position ahead of Malc Hall and Tristan Wilby, but jump starts from the first two trucks saw them sent to the back of the grid and thus Tristan would lead the field off. At the end of a busy five minutes of racing, it was Kevin Fenn who came through to take the victory. That wraps up the 2017/2018 Essex Winter Series Championship. The EWS team have a few special events planned throughout the summer – more details of which will be announced soon – before the 2018/19 EWS Championship will kick off in October to begin the eighth season of racing.